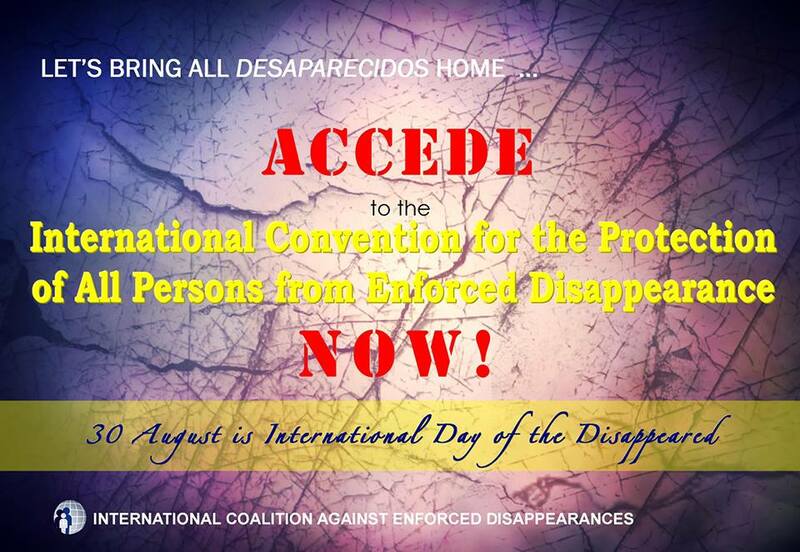 For three years, the United Nations has marked the International Day of the Disappeared on August 30 in recognition of the fact that “enforced disappearances” have no place in a world that aspires to freedom and justice. Beyond this definition, however, is the immense suffering of families haunted by the fate of the “desaparecidos,” the term used for the disappeared in the Philippines. In Asia, where most governments hide behind the pretext of law and order and national security, official rhetoric has failed to cover up enforced disappearances. In Bangladesh, 24 disappeared were documented in 2012. This year, there have already been 14 documented cases, allegedly perpetrated by members of the Rapid Action Battalion, the Police Detective Branch and the Industrial Police. In Jammu and Kashmir in India’s restive northwest, conflicting statements by different government agencies have become a feature of this issue. There have been more than 8,000 cases of recorded disappearances since 1989, yet successive governments have officially downplayed the number. In 2005, the People’s Democratic Party-led government claimed there were 3,931 such cases. In 2009, the National Conference-led government claimed 3,429 missing and then last year, the same government claimed only 2,305 people had disappeared since 1989. Whether there has been just one or thousands of victims is of secondary concern. What is essential is an effective mechanism for probing cases of violations, finding victims, easing the burden and suffering of families and for holding governments accountable within a human rights framework. In Indonesia, the entrenched and successful use of terror during the New Order regime (1965-1998) terrified the populace into not reporting enforced disappearances. Even with the change of government, 414 mostly unsolved cases of missing persons were documented in the restive province of Aceh alone from 1999 to 2005. The decade-long civil war in Nepal from 1996 claimed 1,378 disappeared. On November 21, 2006, a Comprehensive Peace Accord ended the conflict and promised to clarify the fate of the disappeared within just 60 days. Yet in December the following year the government was still at the stage of being required to set up a commission of investigation, a call repeated in various political agreements between various parties and factions including a landmark deal in November 2011. Still a commission into disappearances in Nepal has not been set up. In the Philippines there have been at least 2,214 recorded cases of enforced disappearances, with at least 20 of these committed during the past three years under the current administration of President Benigno Aquino. There has been progress here, however. After 17 long years of lobbying for an Anti-Enforced Disappearances Act, the law was finally signed off last year, becoming the first of its kind in Asia. But passing a law and enforcing it are two very different things in the Philippines, as in many countries in this region.